Ever since I first discovered CG-Arts and the Japan Media Arts Festival, I’ve been delighted to find that every year the festival features at least one short that looks and feels unlike any film I’ve ever seen—my criterion for an excellent film fest. 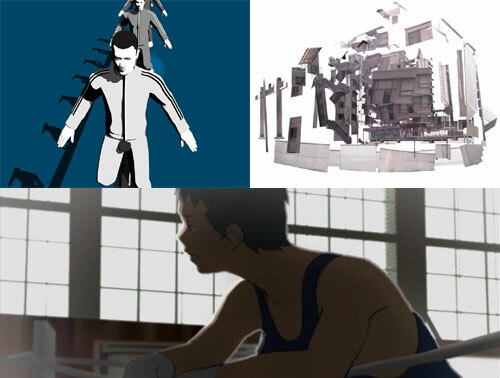 This year one of the most striking was Tomonori Hayase’s Mix a Miniascape. Set to music by Jumpei Yamada, Hayase’s film uses Adobe Photoshop and After Effects to create a funky, unusual Tokyo travelogue. Hayase took hundreds, if not thousands, of photos of people, places and thing as he passed by them, or they passed him. He then assembled the images into a collage, animating his travels through the city by erasing the image of, say, a building piece by piece at the same time as the next image of the same building is being built piece by piece. The effect is of moving through a fractured urban landscape, propelled by Yamada’s breakbeats while navigating periods of both chaos and calm.